Lord Mallinath was the only female Tirthankara and was born in Mithila, on eleventh day of the bright half of the month of Margshirsh . Her father name was king Kumbh and Mother name was -Prabhavati Devi. In the Aparvideh area there was a city named Vitshoka. It was ruled by a powerful king Mahabal. He was very intimate with six other kings who were his childhood friends. Influenced by discourses of ascetics, king Mahabal decided to follow the spiritual path. he sought opinion of his six childhood friends with the remark, "I want to became an ascetic, do you also?" All the six friends replied, "We have been together during both good and bad times. When we have been together during both good and bad times. When we have enjoyed the mundane life in company, it would be shameful if we part company on the spiritual path. We shall become ascetics together and we shall do all spiritual practices together." The seven kings took Diksha from Varadharma Muni and started the spiritual practices earnestly. Mahabala was bitten by the bug of ego. He thought, "I have always been ahead of my friends. Now, if I do the same practices I will remain at the same level. As such I should do a little more and be ahead as before." With this feeling, Mahabala started secretly doing more practices than the others. All the seven friends would formally take vow of some specific penance together but when on conclusion, other friends broke their fast, Mahabala would continue his fast on some pretext. The desire to be above the ordinary inspired this competition. 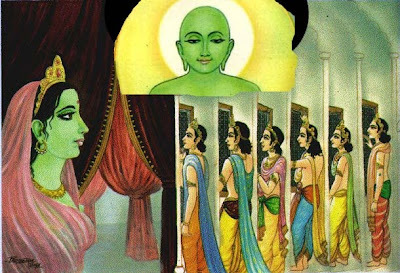 As a result of this deception Mahabala feel from the lofty spiritual level he had attained due to his intense practices and acquired the Karma that would result in being born as a woman (striveda). However, as he still maintained the purity and intensity in his practices he later also earned the Tirthankara-nam-and-gotra-karma. 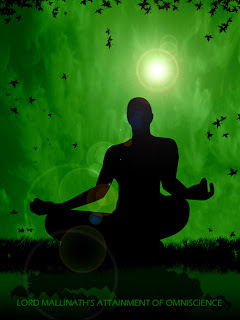 All the seven ascetics breathed their last after sixty days fast and mediation. They reincarnated as celestial beings in the Anuttara dimension. From the Anuttara dimension, a soul traveled into the womb of queen Prabhavati, wife of King Kumbh of Mithila town. At the dawn of the 4th day of Phalgun Shukla, when trees were shedding away there dead leaves as if a Kevali sheds his Karmas, and new leaves were taking place of the old, queen saw fourteen auspicious dreams. She had heard about these dreams when King was discussing about the dreams of Tirthankar mother with a dream expert. She was waiting for the day to break and first she did was to rush to King and tell him about the dreams she had taken. Both were overwhelmed with happiness to know that some of their good deeds have given them the opportunity to become Tirthankar parents. During the third month of pregnancy the queen had a desire to sleep on a bed made of fragrant flowers of five colors and to smell a bouquet of flowers called ‘Mallika’. But the eleventh day of the bright half of the month of Margshirsh surprised everyone when queen gave birth to a girl. Learned people were called, Pandits, Rajguru all studied the stars of the newly born and they all indicated that it was the birth of a Tirthankar. Mothers love for fragrant flowers inspired the king to name her daughter as Malli kumari. As Malli kumari grew up and reached her youth, her beauty also spreaded. From childhood everybody praised her flowering grace, her refined complexion, and her serene manner. When she was eighteen years of age, poets were inspired to write verses about her and artists to paint her portrait. Everyone loved to talk about Princess Malli. In their travels, merchants and ministers, goldsmiths and sculptors, brought news of her incomparable beauty to kings and princes from near and far. One called her the "most wonderful creation on earth," and another likened her to "fresh grapes on the vine." Still another compared her to "a shower of white roses," and a wandering nun who had seen her said she was like "the evening star." The fame of the beauty of Malli Kumari inspired the six kings to send marriage proposal to princess Malli. Each sent a messenger with a letter to the king of Videha to request the hand of the princess in marriage. The first to arrive delivered a letter which stated, "I am eager to marry your daughter, and for that I will do anything you require of me. However, if you do not accept my offer, it will breed war between my land and yours." The second messenger delivered a similar proposal. In a month, six such proposals came from the six infatuated kings of the neighboring lands. Hearing the same request from all six messengers, King Kumbh became alarmed and called upon his guards to drive them all away. As a result, the six kings consulted one another and decided to join together to attack Videha. They came with their armies trailing behind them. While they awaited the king's answer, a large number of soldiers engulfed the small kingdom, placing the king in a trying position. He did not know what to do. He could not decide who should marry his daughter, and his army was not strong enough to force them to go home. Malli noticed her father's distress and addressed him. "Father, dear, why are you worried? There is no need for concern. Send a message to each king that I am ready to marry. " "What?" he asked. "You are ready to marry? But which one? There are six!" "To all six of them?" her father inquired incredulously. "Yes!" she replied. "All six! Be sure not to tell one about the other. Let each one think he was invited alone!" Seeing the flame of confidence in her eye and hearing the conviction in her voice, her father knew that the princess was fully aware of what she was doing. So he sent her message to each of the six kings separately. A fortnight passed. On the appointed night, all six came to her door. When they saw one another, they could not understand why all six were there. They looked at each other and the coals of jealousy began to burn within each one's heart. Each had cherished the thought that the invitation was only to him. Each began to feel the pain which comes from striving to gain and fearing to lose a material thing--in this case, the hand of the princess in marriage. Meanwhile, the princess came and opened the door. She invited them into her hall. To their surprise, they saw there a beautiful statue of Malli. Each feature was precisely the same as hers. It was life-size and made of gold. It was so bright that it dazzled their eyes. It was an exact replica of Malli and looked truly alive. As the princess stood beside the statue, she greeted the kings, "Welcome to you! So, you have come here, have you? And do you want to marry me?" As they all murmured "Yes," Malli pressed a device behind the statue and a lid at the top opened up. All of a sudden there was such an offensive odor that the kings were completely confused and disturbed. They could not bear it. "What is this?" they asked. "Oh, it is nothing!" she explained in a matter-of-fact way. "When I heard you were all coming to seek my hand, I thought, 'How to receive them? They are coming here to marry whom, to marry what?' I wanted to know, 'Have they really come to marry me, or my body?' So at each meal, I would put a morsel of my food in the hollow part of this statue. It is a very small amount. I have been collecting a few morsels a day for only fifteen days, and yet it rots and gives off this odor." The kings were both dazzled by the beauty and baffled by the smell. The pleasant and the nauseating--it was difficult for them to manage! In that confusion, they began to wonder why they had come. Then the princess told them, "Let us go out of the room. Come and sit here with me. Why do you think that the six of you are attracted to me? Is it only beauty or is it something different? Now you know that beauty is only as deep as the skin. You have smelled the decomposing elements of the body and you did not like it. There is something more that has brought you here. It is that which attracts you, not the body. Close your eyes, meditate, and see." In that moment of silence, a glimpse came to each of them. They saw that all seven of them had been together in a past life. They had been living a good life and all were spiritual aspirants. But there was still something binding them which they could not yet understand. It was some kind of leftover dependency. Because of that, they each had to take another birth. Otherwise, they would have reached Enlightenment in that very life. As they caught that glimpse, they understood when Malli told them, "We are on the path to the Light, but in our last birth we forgot our glimpse of it; for a while we were blind. That is why we had to take this birth." The kings told her, "Now we want you to guide us. You are our teacher. We want to finish this cycle of birth and death." So she said to them, "The magnetism we feel is not toward the body but toward the soul. The soul remains together with this body while we journey through this human life. But the two are not to be confused. Each one has a completely different nature. So let us use this life to bring out the soul, to purify our awareness, to reach our destination of freedom." The seven of them took the path to liberation together and led a beautiful life. Malli announced her decision of renunciation. After renunciation she acquired Vipulmati Manahparyav Gyan and started deep meditation. She attained omniscience the same afternoon. Malli ultimately became Mallinatha, the nineteenth Tirthankara, or "Perfect One." She then preached the true religion for long time and then went to Sammet Shikhar and attained Nirvana. She is known in Jain history for having taught mankind how to differentiate between the pure flame of soul and the melting elements of the body. This article was as per Shwetambar accounts. Though personally I am diplomatic about answering whether the Lord was a male or female. This article was shared in order to focus on the story based on Lord Mallinath's life. (1) Our scriptures clearly tell that spiritual knowledge and self realization is not prerogative of males only. Ladies can also attain the highest spiritual status. (2) The real self, Atma or soul is beyond gender. Souls is not male or female. (3) Soul - as a part of the divine super consciousness is immortal, but is compelled to take births and rebirths due to unsatisfied desires. Once it becomes free from desires (vaasnaas), it is merged with the vast eternal conscious - that is Moksha. So, please thank Mr. Rahul Zota, who shared this story of Bhagvan Mallinath in so beautiful words. Please do not challenge for proof. Is there an order to the 24 Tirthankaras? Is it the order that their souls were liberated? According to shwetambar mallinath was a female . Its upto u to follow Digambar or shwetambar . I personally follow shwetambar and I love the fact that even females are given same respect . Well explained and beautifully written. Can you please share some links from where did you learn about this story? Thanks. I am eager to learn more about Lord Mallinath. True story.every where somE exception is present in nature; 19th tirthankar born as female. As per tatwarth sutra mithila was the also centre of salvation,Jain and Vaishnavism..